Gitana was originally built in 1984 as a Maxi yacht for the Rothschild family. 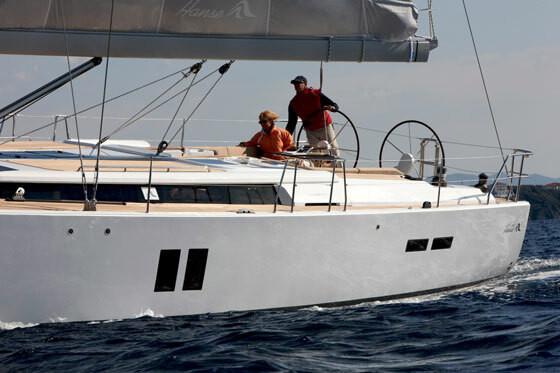 The vessel was designed by well known German Frers naval architects in Italy. 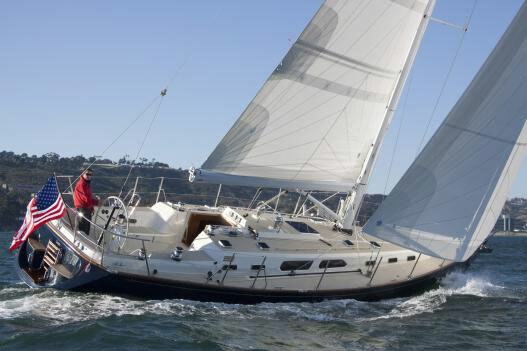 Subsequently she underwent refits and conversions to a fast cruising boat first in 1996, then in 2003 and again in 2007. The vessel is 71' long with an aluminum hull and composite foam/glass decking with teak wood overlays. The interior is in the European style with custom designed and built teak joinery work. The vessels hull was built by Solimar Pesaro and finished by Trehard Shipyards in Italy. 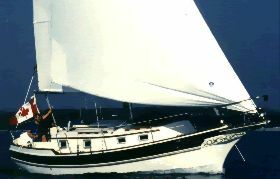 In 2006 Gitana had her rig upgraded to a new four spreader Carbon fiber mast and Carbon fiber Park Avenue styled boom with new SS rod standing rigging and Spectra running rigging and runners. The mast is keel sump stepped with pins and hydraulic settings. The chain plates are massive aluminum welded bar and plates with inner hull stainless steel tie rods. In addition the vessel has a 1995 225hp, six cylinder Perkins marine diesel auxiliary and a lOKW diesel ships generator plant mounted in a sound shield in the fore peak. The hull scantlings are massive and strong to withstand severe sailing conditions anywhere in the world. This was regarded as a lightweight vessel at the time of its' original build but by todays' standards it is a ruggedly built offshore sailing vessel. She was designed and built to last generations. The previous owner spent considerable sums of money over the years to maintain and upgrade the boat and its' current owner has maintained the essence of the boat to the same standards with his maintenance regimen. The replacement cost of a comparable vessel to Gitana would be approx. 3 million dollars. The boat has been recently and completely updated and renovated several times and in many ways is in better than new condition. She is a credit to both the owner and captain who so obviously care for her deeply and have spent not inconsiderable sums and resources on her upkeep. 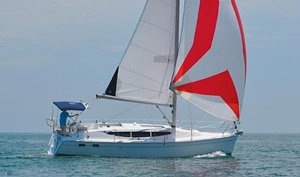 Gitana's hull is a strongly built aluminum hull with a moderate draft but efficient keel with a small shoe that yields excellent speed at all wind angles. The hull is built of welded aluminum plating with massive inner grid structures with framing, large stringers and longitudinals throughout. The keel plate is 5/8" with 3/8" side plates at garboard sections and ballast keel of lead with sixteen stainless steel bolts. The rudder is constructed of Carbon fibre with a stainless steel post and internal structure. The hull and cockpit were awlgripped in 2006. The deck is composite construction with PVC foam core, covered with a half inch thick teak deck. The flush deck layout reflects simplicity and efficiency. Primary winches are located in front of the aft cockpit and are hydraulically driven as is the headsail furling system. The cabin interior is highly gloss finished with teak trim and joinery throughout in marine balsa cored plywood and solid woods or veneers. Where accessible all cabin sections are bonded to hull and decks for added strength. All surfaces except for galley and head areas are varnished. All cabin soles are varnished teak and holly panels, most of which are removable for servicing components and tanks in the bilge and other parts of the boat. The vessel is yacht finished throughout. The large main salon has a settee to port with an electrically operated dining table that doubles as a coffee table and made of Corian. To starboard side is another settee with ample storage beneath and behind. Outboard on both sides of the salon are finely crafted teak lockers, cabinets and shelves. There is a 23" Sony Wega flat screen LCD television mounted in the outboard starboard salon locker and a new entertainment system including a Panasonic SA-H100 receiver, Panasonic S-27 DVD/CD/MP3/Jpeg/WMA player, Sonance interior speakers and Bose waterproof cockpit speakers. The interior joiner work is teak with hand rubbed satin finish and gloss highlights. There are halogen and regular interior lighting throughout operated on a dimmer system. The floors throughout are teak and holly recently stripped and revarnished. The overhead panels are covered in ultra leather throughout. The Galley is to starboard of the companionway and is equipped with double Corian sinks and work surfaces, lockers, drawers, a garbage container, two refrigerators and a three burner stove w/oven. The galley and equipment were all new in 2006. The Master Stateroom has a large double berth to port with locker storage outboard and under the berth. There is a hanging locker on the aft aide with a vanity with more locker storage on the starboard side. The ensuite head is forward to starboard with commode, vanity and separate shower stall. The Guest staterooms feature upper and lower berths, hanging lockers and drawer storage. These cabins share a head forward of the salon on the port side which has commode, vanity and a separate shower stall. Gitana is a sleek, European racer/cruiser. Designed by German Frers for the Rothschilds, she has undergone modifications and refits in 1996, 2003 and 2006 and is now a very striking cruiser/racer. The clean lines of her teak decks are carried below to the warm European, teak interior with three staterooms, two heads and a large main salon. 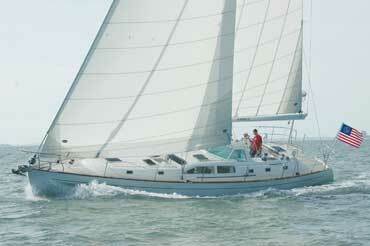 Well maintained by a caring owner she is the ideal yacht for day sails or cruising the coasts in comfort. There is a complete suite of B&G and Simrad electronic instrumentation at the helm and navigation stations station consisting of a CR44 multi function display, auto pilot, wind and knot log. There is also a Samsung multi repeater at the helm station. In addition there is an Icom VHF M402 and an Icom SSB 801 set positioned in a cupboard at the navigation area. All are well installed and fully functional. The electrical system on this boat is very robust and substantial and consists of 50 amp 220 volt shore power connection running through an Acme galvanic isolator. There are a large amount of 120 volt receptacles throughout the boat. There are 2 x lOO amp Mastervolt chargers for the battery banks with one dedicated specifically for the batteries that supply the refrigeration units which are situated under the port side settee in the main saloon. The majority of batteries are under the sole in the main salon. The battery system is of the 24 volt negative return type with all wiring to ABYC standards. There is a separate battery for the generator set adjacent to the generator in the fore peak. The vessels plumbing, wiring and tankage are suitable for any parts of the world and are to ABYC/NFPA/USCG requirements throughout. Fuel is contained in 5 diesel tanks; two forward on both port and starboard with a capacity of 30 galls each. Additionally there are two aft and these have a capacity of 80 gallons each. There is a day tank in the bilge with a capacity of 40 gallons. Tanks are correctly bonded and vented. Water is contained in welded aluminum tanks with a total capacity of 290 gallons. There is a Raritan 240 volt hot water heater. 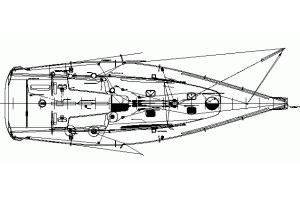 Water is pumped by a selection of 24 volt Par pumps located in various parts of the boat. There are plastic holding tanks for each toilet with an approximate capacity of 30 gallons each.